The growth of America’s non-manufacturing sector accelerated more than analysts expected in August. The Institute for Supply Management reported big gains in business activity and new orders for the largest part of the economy. Although the employment component grew at a slower pace, non-manufacturing expanded for the 43rd month in a row. The U.S. trade deficit narrowed more than expected in June as exports grew to a record high and imports receded, according to the Bureau of Economic Analysis. The gap between exports and imports was the lowest since October 2009. 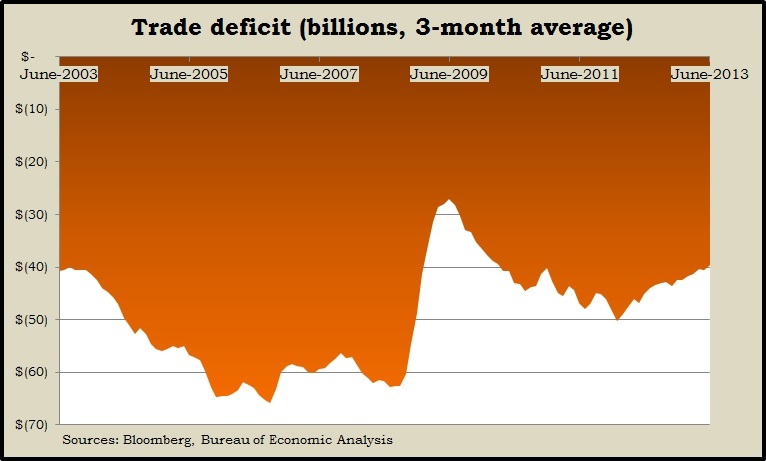 Less reliance on imported oil helped narrow the deficit. Excluding oil products, the gap was the lowest since March. The amount of consumer credit outstanding kept growing in June and reached a new peak. The Federal Reserve reported that the bulk of the credit run-up continues to be in the form of student loans, car financing and other non-revolving credit. Revolving credit, which includes credit cards, dropped and is down 16.5% from its 2008 peak, suggesting reluctance by consumers to spend money they need to borrow. The four-week moving average of initial unemployment claims feel for the fourth week in a row, reaching the lowest level since November 2007, before the Great Recession. Labor Department data show new jobless claims staying below the long-term average.